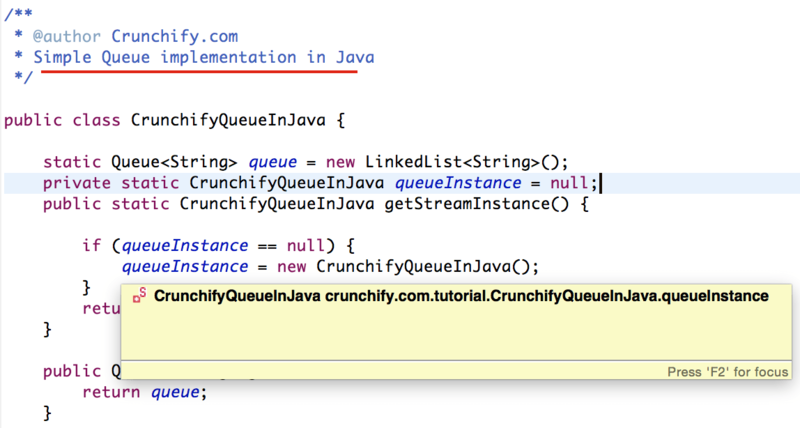 What if you want to implement your own Queue class in Java? The Queue module provides a FIFO implementation suitable for multi-threaded programming. It can be used to pass messages or other data between producer and consumer threads safely. Create a global Singleton Queue object through out your project. One Process of Object may use this Singleton object to add String at any given time. At the same time another Process or Object use the same Singleton Object to get what ever you pushed 1st in FIFO order. Basically implement a Queue Object – A thread-safe FIFO implementation. Well, I had the same requirement last week for my project. So I’ve created one simple Queue Object in Java which solved my above issue. Wanted to share the same with my readers..
1) Is it really doesn’t needed to synchronize polling and empty/size retrieving? 2) I believe it could be more descriptive if you provide some multithreading test, can you? Hi Alexey – In above example it seems we don’t need synchronized block but we have here generalize solution in which we may insert ~10000 records/minute and poll ~5000 records/min. You may achieve point 2 if you have big enterprise level Spring application and you have scope of this class is “Singleton” and use the same object everywhere. Will try to post and simulate similar behavior probably later. Thanks for posting and feel free to let me know for any additional query you may have. Thank you for answers, but anyway, I believe that we have to either sync all the access to the queue or use syncronized collection. Because in case when we what to iterate over queue while(!isEmpty()) parallel thread can insert some data in queue and we miss it, I am wrong? Regarding my second question I just want to note that in case if you describing something multi-threaded it must be confirmed by appropriate tests. Good point Alexey. We could also use “ConcurrentLinkedQueue” instead of “LinkedList”. It’s an unbounded thread-safe queue based on linked nodes. This queue orders elements FIFO (first-in-first-out). The head of the queue is that element that has been on the queue the longest time. Just tried in my Eclipse environment without any issue.